Makers Mark Gallery is situated at number 42 Church street and houses a very unique collection of art. Consisting of renowned South African and Australian artists – including some Aboriginal pieces. The gallery changes it’s works every second month and is a ‘must see’ for anyone who appreciates the arts, and connoisseurs alike. "A real PEAK OF ADVENTURE!" 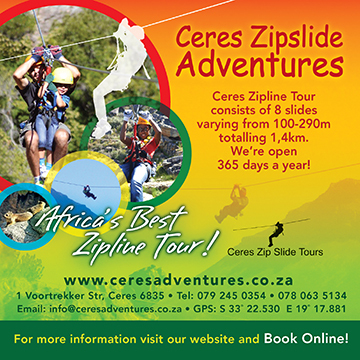 A Private Nature Reserve with a very challenging 4x4 route, different types of accommodation and lots of activities for the whole family or corporate group. "Decadent and delicious Belgian chocolates"
Visit Moniki Chocolatier for decadent and delicious Belgian chocolates at Manley Wine Lodge. Explore the Tulbagh Valley by Mountain Bike. Tour our beautiful valley in peace and tranquility by hiring a mountain bike from the Four Star Tulbagh Hotel, conveniently located in the middle of Van der Stel Street, the main street, next to the Standard Bank. The Murludi fruit farm offers visitors a 4 km and 10 km hiking trail set in beautiful mountain fynbos and indigenous forest.